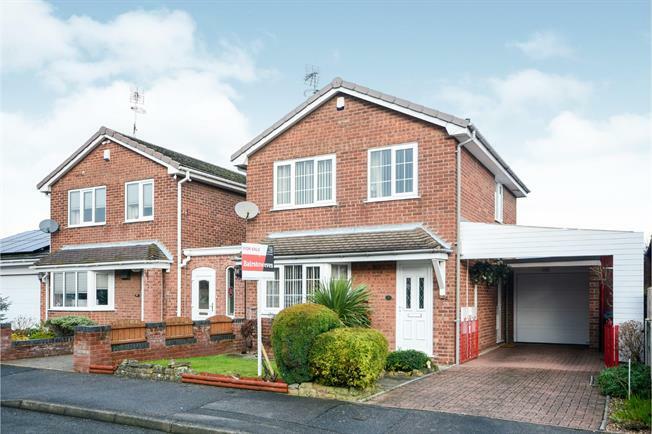 3 Bedroom Detached House For Sale in Mansfield for Offers Over £160,000. PERFECT FAMILY HOME! Bairstow Eves are delighted to welcome to the market this stunning three bedroom detached property to the market which would be ideal for families and first time buyers. The property comprises of an entrance hall giving access to an open plan living room and dining room with doors opening out onto the enclosed rear garden and an internal door to the kitchen. The first floor comprises of two good sized double bedrooms with the bedroom on the rear offer picturesque views of the surrounding countryside. The first floor also has a third single bedroom and modern shower room. Additionally the property has double glazed windows throughout, gas central heating, off road parking, single garage with electric door and enclosed rear garden with summer house. Viewings are strongly recommended to appreciate what is on offer so please call the office for viewing arrangements. Double glazed uPVC bay window facing the front. Radiator and electric fire, carpeted flooring, ceiling light. Double glazed uPVC window facing the rear overlooking the garden. Radiator, vinyl flooring, ceiling light. Roll top work surface, fitted, wall and base and drawer units, belfast style sink, integrated, electric oven, integrated, electric hob, over hob extractor, integrated washing machine, fridge, freezer. Double glazed uPVC window with frosted glass facing the rear overlooking the garden. Heated towel rail, tiled flooring, ceiling light. Low level WC, double enclosure shower, top-mounted sink, extractor fan.